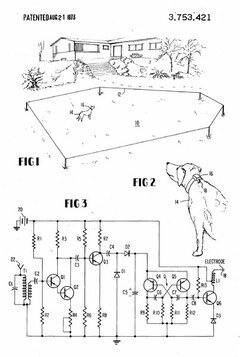 Richard Peck, a traveling salesman from Trexlertown, PA, invented what we now know as a dog fence in 1971. Peck was troubled by seeing all the stray dogs that ended up on the roads and looked for ways that owners could keep their dog inside their property without an expensive and visually obtrusive fence. Working with an electrical engineer, Peck came up with the idea of using boundary wires in conjunction with a receiver collar to keep a dog contained. Peck patented his invention in U.S. Patent Number 3,753,421, entitled ‘Method and Apparatus for Controlling an Animal.’ Peck called his invention Stay-Put, but the product did not take off until Peck sold it. In 1976 John Purtell, then a young equities sales executive, purchased the patent from Peck and changed the name to Invisible Fence®. Purtell created a comprehensive installation and training process and began to sell the product in Pennsylvania. After several years of building sales in the Philadelphia area, Purtell began to expand the company by marketing the Invisible Fence® product nationally. After building the company through a large dealer network in the U.S. and a few other countries, Purtell sold his interest in the company in 1993 while Invisible Fence was at its peak. After the Peck patent expired in 1989, many new companies entered the industry. These include Pet Stop®, Dog Guard®, Dogwatch®, Petsafe®, Contain-a-Pet®, Innotek®, and several smaller regional and internet-based companies. Invisible Fence® Company was bought and sold several more times and is now owned by Radio Systems Corporation®, which dominates the industry. Invisible Fence’s parent also makes the DIY dog fencing brands Petsafe and Innotek, manufacturing its pet containment products in China. Meanwhile, Purtell re-entered the pet containment industry in 2002, partnering with Cincinnati entrepreneur Bob Slattery in his company Perimeter Technologies, makers of Pet Stop Pet Fence Systems®. 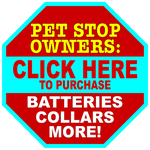 At Pet Stop, Purtell has been joined by several of his past Invisible Fence® compatriots including former Invisible Fence chief engineer Scott Touchton. Committed to domestic manufacturing, their products are made in Pennsylvania. 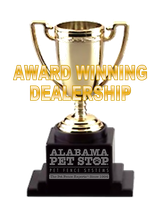 Together they have built Perimeter and the Pet Stop® brand into a major competitor in the industry, surpassing all but his former company through innovative use of alternative technologies and the creation of several cross-platform products, another industry first. In recent years, smaller companies like Dog Guard and Contain a Pet, which employ the industry’s oldest technology and have no engineering staff, have lost market share and their best dealers to companies that have continued to develop new technologies and innovative products. Industry middleweight Dogwatch seems to have suffered somewhat as the industry matures and adjusts to changing economic conditions, recently losing many top dealers to the more aggressive Pet Stop network. PetSafe Pro, the professional ‘dealer network’ version of the DIY Petsafe brand, was dissolved in 2007 to make room for the Invisible Fence network they acquired when they purchased Innotek/Invisible Technologies in 2005. In the aftermath, most of the Petsafe Pro dealers moved to the Pet Stop network, too, rather than to their own Invisible Fence dealer network. In 2009, the Petsafe Pro network tried it again, but has disappeared again as of this writing. Well into its fourth decade, the dog fence industry has become mature. Now companies compete for market share by providing greater value, more advanced technologies, and by offering both DIY and professional products to serve customers at every economic level. So far, the clear beneficiaries of these conditions seem to be Radio Systems, with its huge worldwide retail DIY-based business and Invisible Fence professional brand, and the smaller Perimeter Technologies, with the technology edge of the professional Pet Stop brand and the growing popularity of the DIY Perimeter brand. Companies who sell cheaply made and low quality DIY pet fences now abound, easily found all over the internet. The manufacturers who also make professional products seem to make the best DIY products, as some of the technology appears to be shared. Professional dealer networks still provide the best products and offer training and other distinct advantages. A properly functioning, configurable wireless pet containment system was the Holy Grail for pet containment executives and professional dealers for a decade. It was widely held that the company that introduces a high quality, high success rate system such as this will have a colossal advantage in upcoming years as the industry continues to mature and distill. It would seem that Radio Systems Corporation, with its ten year head start in wireless technology and the deepest pockets in the industry, would have a decided advantage in the race. But currently affordable GPS technology is still not accurate or reliable enough to trust with out pets, so other avenues are being actively explored to continue improving dog fences. In the end, the consumer will enjoy better products, at even more competitive prices. As DIY systems improve, more expensive professional systems will have to excel and justify their prices with new features and technology. Professional Dealers will have to offer additional value-added services and provide excellent customer service – something the industry’s most familiar professionals are not exactly known for. Some well-known names may not survive future developments, but those willing to take smart risks should thrive.